Keep the mud off your clean floors by reminding your customers and staff to wipe their feet as they enter. Can be used for indoor or outdoors. Sign reads "Notice Please Wipe Your Feet"
Custom Caution Sign 12" x 18"
Remind your customers and employees to wipe their feet at the door when entering into your establishment. 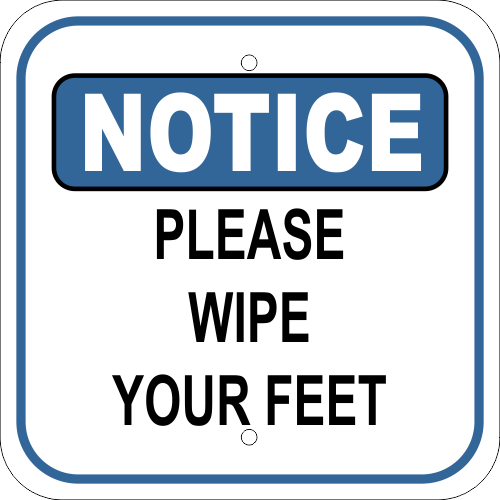 This 12” x 12” aluminum Please Wipe Your Feet Notice Sign is the perfect sign to place in mud rooms or an entryway when you have harsh outdoor weather conditions. This sign is printed on vinyl and mounted to heavy duty .063 aluminum. Two pre-drilled holes are at the top & bottom for easy installation. Perfect for adding to a U-Channel post outside your doorway. Aluminum has 1.25” radius corners to protect you from sharp edges and gives a professional finished appearance. For longer life of your printed sign, add lamination for a few dollars more. Lamination helps protect from UV rays to extend the life of your sign and is recommended for outdoor signage. For indoor use, the vinyl print & aluminum will last for several years. Order this Please Wipe Your Feet Notice Sign to help keep your areas clean of the outdoor elements. Most orders ship the next day!